The Hokies have worn far worse in big games (see Alabama 2013). This uni looked pretty good. It’s always hard to make an orange helmet work with a uniform that was almost completely maroon. But the helmet didn’t look out of place. Wasn’t my favorite uni ever but it looked pretty good overall. I really liked the helmet. Only loses points for being a rehash of Navy’s helmet from 2013. The jersey/pants combo is the best white uni combo we have. A problem we’ve had in the past was pairing a good jersey/pants combo with a bad helmet (see the cartoon helmets from 2012). This uni combo was a winner. The only issue I can find with it is that it’s not particularly original. This is going to be a very good game. Ohio State has had a year to stew on the one blemish on their otherwise perfect record last year. Virginia Tech is hoping to show the nation that last year was no fluke and they can do it again this year at home. Ohio State is clearly the more talented team. Urban Meyer has recruited very well in his first three years in Columbus and he has four and five star talent all over the field in addition to very good depth. This is a team not to be taken lightly. 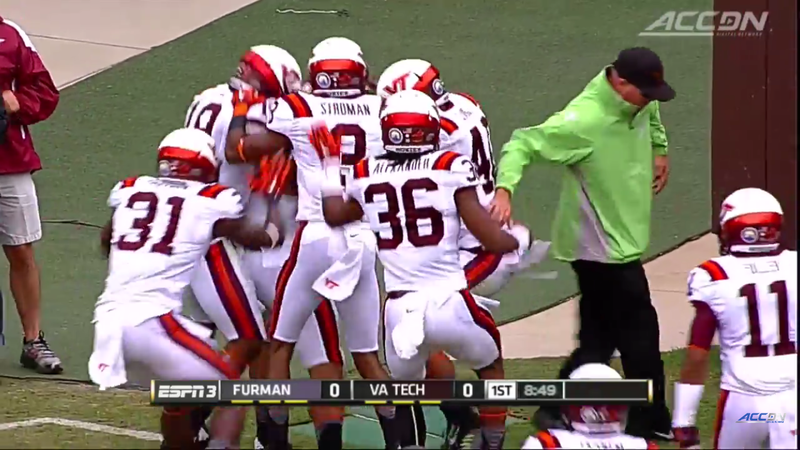 It is probably one of the best teams to come to Lane Stadium in the last 20 years. So why should Hokie fans have hope that VT can win? A couple of reasons. First, we have Bud Foster. He is one of the best minds in college football and the battle between him and Urban Meyer will be worth the price of admission. They will be making adjustments and counter adjustments all night long. Second, don’t discount the effect that a rowdy night game at Lane Stadium has. I know Lane Stadium hasn’t been quite what it’s been in the past the last three years. But this is a night game on national TV going against the #1 team in the country. There will be no other football on TV Monday night. It doesn’t get any bigger than this and Hokie fans know it. Third, the VT offense was ill-prepared to pull the upset last season. The offense was very young. They had a new QB that had spent all of four weeks learning the offense. An offensive line that was still working on coming together. And RBs and WRs who were in high school just months before that game. This time the offense has had a year under its belt and it should be a more even match up. This is a really tough game to pick. First off, week 1 of the college football season is always crazy. You’re never quite sure what’s going to happen in any game. But beyond that, you know that Ohio State has had this game circled since last September and the Hokies know it’s a big opportunity for them to make a statement on a big stage. Ultimately, I think Ohio State just has too much fire power across the board for the Hokies. I think it’ll be a close game going into the 4th quarter with Ohio State pulling away by 10-14 points. Ezekiel Elliott is the difference. The less yards he gets, the more likely it is that the Hokies win this game.